Several of the SMART tools programmatically send emails and text messages for either periodic or exception reporting. This screen documents the several ways that it is accomplished. You can send a text message to my phone using this address: 4019963631@vtext.com (Verizon). I always get stuck on having the correct References checked in the VBA module. 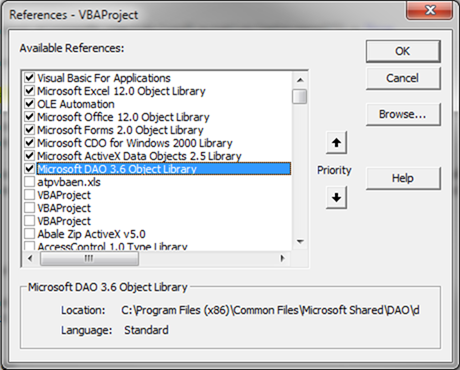 This is the screen shot of the enabled references in a file that uses this routine. The "Microsoft CDO for Windows 2000 Library" is required. This code works for me. The best code is the code you do not have to write yourself. Included are the web sites where I found this. .Subject = "There are " + CStr(n) + " alarms"
Note: One has to modify the security setting on the Gmail account to allow "Access for less secure apps"
I ran into issues recently with configuring a Windows 2012 R2 Server to send out emails. The below "SendMail" routine refused to work. I was able to quickly modify the above CDO approach to work with Office 365. Again, you have to make sure the proper references are checked. You may want to hide the password in some way, shape or form. The parameter cdoBasic evaluates to a value of 1. Note that the smtp port value is changed from the gmail example. By far the simplest way to do so is by using the SendMail method. This sends an email with the active document as an attachment. Being a lazy programmer, I often create a blank document just to send an email this easy way. This example sends the active workbook to a single recipient. Blat is a Win32 command line SMTP mailer. vSENDEREMAIL = "SAFEmail@CMCorporation" ' Default Sender for ECR. vRECIPIENTS = vRECIPIENTS + "," + ThisWorkbook.Sheets("Detail"). [CurrentEmail].Value + "@cmcorporation.com"
.Body = "This is easy!" Outlook blocks efforts to automatically send emails. 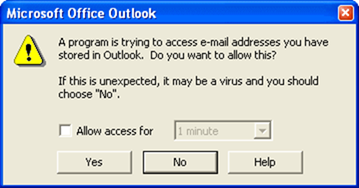 This free utility allows the automatic emails to proceed by automatically clicking "Yes" when Outlook presents this screen. This web page was last updated at 03/02/2017 11:43 AM and is written in EXCEL!